The ukulele. Image courtesy of John Cheung. Hawaii is a true melting pot of many ethnicities. They range from those with Hawaiian ancestry, from Asian backgrounds as well as those from Europe, including Portugal. During the late 19th century, men and women immigrated from the Portuguese islands of Madeira and Azores to the Hawaiian Islands. This migration lasted from 1878 to 1913, bringing many of the Portuguese influences evident in Hawaii today. Some of these items have become iconic aspects of Hawaiian culture, whether it is in food, customs or music. One of icons is the ukulele. Here is an overview of the history of the ukulele. The history of the ukulele in Hawaii is a colorful one. Most people associate the ukulele with Hawaii’s island-culture, without knowing the instrument’s true origin. 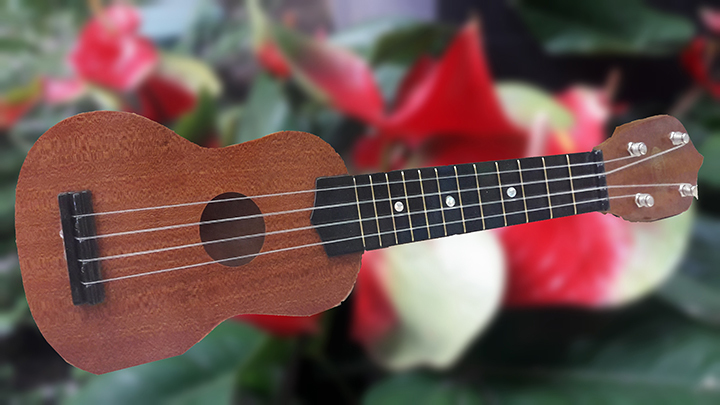 According to one version of the history, the ukulele made its first appearance in Hawaii in 1879. This occurred with a new immigrant from Madeira, named Joao Fernandes. His arrival in Hawaii made him so happy that he began playing a braguinha as soon as he was off the boat. The braguinha was a precursor to the ukulele. His joyful playing and the way his fingers danced up and down the strings astounded onlookers. As a result, they began to refer to the instrument as the “jumping flea.” The word ukulele itself comes from the Hawaiian words uku, meaning gift or reward, and lele, meaning to come. The beautifully crafted instruments are in the guitar family. Although they are usually strung with four nylon strings instead of customary six steel strings on a regular guitar. Ukulele makers typically make the instrument from the native Hawaiian koa tree, mango, mahogany, cedar, redwood or spruce. There are four main kinds of ukuleles, ranging from smallest to largest. The soprano is the most common. The concert is popular for live performances. Musicians typically play the tenor in acoustic or recording sessions. While others play the baritone where deeper tones are needed. Most ukuleles have 4 strings, although there can be as many as 10 or 12 on some variations of the instrument. King David Kalakaua popularized the instrument in the late 19th century by learning to play it himself. He also did this by encouraging the playing of ukuleles during hula dances and royal ceremonies. Because of its popularity, three men from Madeira named Augusto Dias, Jose de Santos, and Manuel Nunes, opened up a ukulele shop in Honolulu. Their beautiful ukuleles would sell for about $5 apiece. As Hawaii was becoming a hub of travel and trade, stores soon began selling ukuleles on the mainland US and elsewhere. Although ukuleles have fluctuated in popularity, you can still hear them in jazz music, romantic songs and even film soundtracks. Ukulele performers from Hawaii have found a new and appreciative international audience. Hawaii-born Jake Shimabukuro is probably the most famous guitar virtuoso in the world today. He has been featured in many worldwide concerts as well as on the national media. While they are now manufactured worldwide, the origin and sound of ukuleles are still associated with Hawaii. The history of the ukulele in Hawaii and its legacy continue to flourish. Today, you can hear ukuleles in Hawaiian hula dances, at Hawaiian weddings or at the beach. During every July on Oahu, music lovers celebrate these iconic instruments at the annual Ukulele Festival. The festival offers hours of open-air ukulele concerts, authentic Hawaiian food booths, ukulele displays, lessons and even free instrument giveaways. Tourists and Hawaii residents unite to celebrate a mutual love of music and Hawaiian culture. One of the most notable moments of the events occurs when nearly 800 young students play in a stunning ukulele orchestra. Families planning a trip to Hawaii should consider going to Oahu in July during this festival. This is because this is an unforgettable way for children to expand their knowledge of these beautiful instruments. One of the most beautiful aspects of Hawaiian culture is the music. So for many, there is no sound more soothing than the melodious strumming of a ukulele.